Introduced to western science in 1911 by Scottish botanist and well-known plant explorer George Forrest (1873 – 1932), Rhododendron impeditum is an attractive dwarf, flowering shrub often planted in rock gardens. It is a native to the Yunnan province in southwest China and was named and described for western science in by Scottish botanists Sir Isaac Bayley Balfour (1853 - 1922) and Sir William Wright Smith (1875 – 1956). The species name is from the latin word 'impediō' meaning supine (prostrate, stretched out). 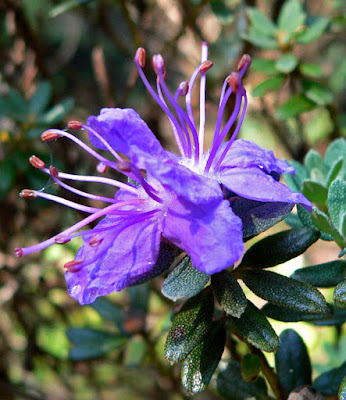 Commonly known as the dwarf purple rhododendron, you can expect Rhododendron impeditum to reach a height of up to 60 cm when grown under favourable conditions, It has small, aromatic leaves and widely funnel-shaped bluish-purple flowers which appear from April to May. The blooms will need to be protect from damaging late frosts. Rhododendron impeditum will be happy in a sheltered position in full sun to semi-shade. The soil should be acidic humus rich, reliably moist but well-drained moist. Avoid planting too deeply, and if necessary dig plenty of ericaceous compost into the soil before planting. Apply a generous mulch of leaf mould around the base of the plant each spring maintain soil moisture and stable soil temperatures over the summer. Rhododendron impeditum received the Award of Merit from the Royal Horticultural Society in 1944 and the Award of Garden Merit in 1984. Stan Shebs image is licensed under the Creative Commons Attribution-Share Alike 3.0 Unported license.